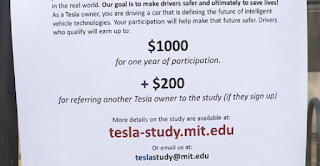 Massachusets Institute of Technology's AgeLab is looking for Model S owners around Boston who are willing to participate in a research initiative in exchange for $1,000. A poster has been spotted on a Chargepoint around the campus with details about this study. 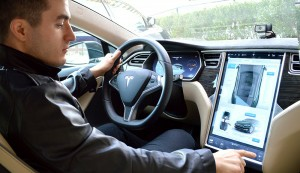 According to the study, the research's goal is to "analyze vehicle technology use in real world scenarios". The MIT AgeLab is a multidisciplinary research program that works with business, government, and NGOs to improve the quality of life of older people and those who care for them. "Our goal is to make driving safer and to save lives!" the poster states. MIT AgeLab will install 3 cameras aimed at recording their movement in the car for a whole year. Specifically, the 3 webcams will collect audio - except for the one installed on the dashboard -, GPS, and vehicle telemetry (steering wheel position, etc) data which can be permanently deleted by the driver. In exchange they will be rewarded with a sum of $1,000. Before signing up it is worth noting how this sum is awarded: $150 for the initial instrumentation, $50 per month for participation, $50 for permitted access to the vehicle and $50 for completing experimental questionnaires and interviews. 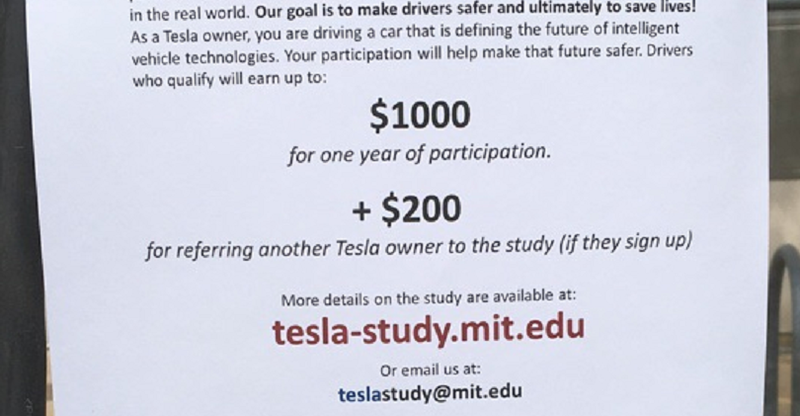 Referring another Tesla owner will net you a bonus of $200 after they sign up. It is not clear if this research is aimed for specific age group however ultimately this study is aimed at developing safer and smarter vehicles on the road both for drivers and pedestrians. Details of the study and how to participate can be found here.